Mr. Shipp is a lifelong resident of Northern Kentucky. His practice is focused on civil litigation and municipal law. 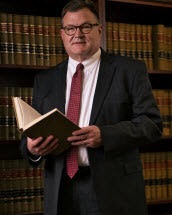 Mr. Shipp has extensive experience representing clients in state and federal courts at the trial and appellate levels with respect to a number of substantive areas including: personal injury and wrongful death; products liability; insurance coverage disputes; constructions disputes; commercial disputes; and representation of municipalities in various civil matters. In addition, Mr. Shipp has been involved in advising clients regarding out of court resolution of disputes through arbitration and mediation. Mr. Shipp has also served as an arbitrator and mediator. Mr. Shipp served as a City Councilman for the City of Edgewood, Kentucky for ten years; as a Director of the City of Edgewood Public Properties Corporation; as a member of the St. Pius X Board of Total Catholic Education and Parish Council; and on a number of professional committees associates with his legal practice.